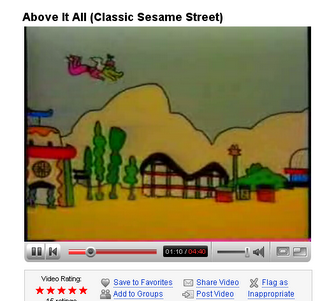 Wow 3500 views of this Sesame Street song I did in 1989. And such nice words of praise too. 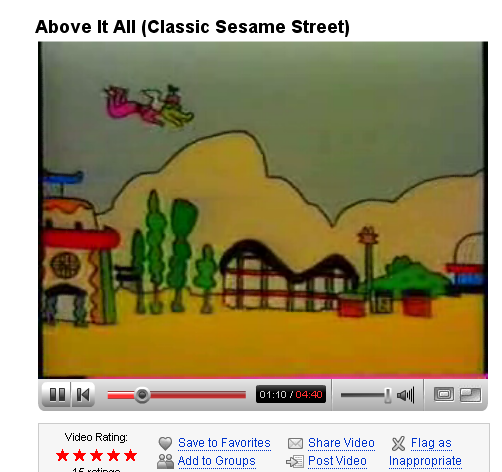 If I got a dollar for every viewing I could give extravagant presents this Christmas. But then I don't own rights to the piece-- oops-- but then I got paid peanuts-- oops-- but then what is happening to copyright law these days? I never particularly liked this song, "Above It All", but it was run more than any of the others, and seems to have really struck a memory ping in the youtube audience. Some of the comments people have posted have great depth to them. Oddly, my other films are also up on youtube, and have only a fraction as many views. You can see it here. Right now I'm doing a new animated piece for youtube. So stay tuned.